Every day, one in ten people in Massachusetts does not know where their next meal will come from. The Greater Boston Food Bank is an amazing organization that acquires and distributes food that enables local food pantries, soup kitchens, community health centers and other partners to do their vital work of providing nutritious food and meals to those in need. 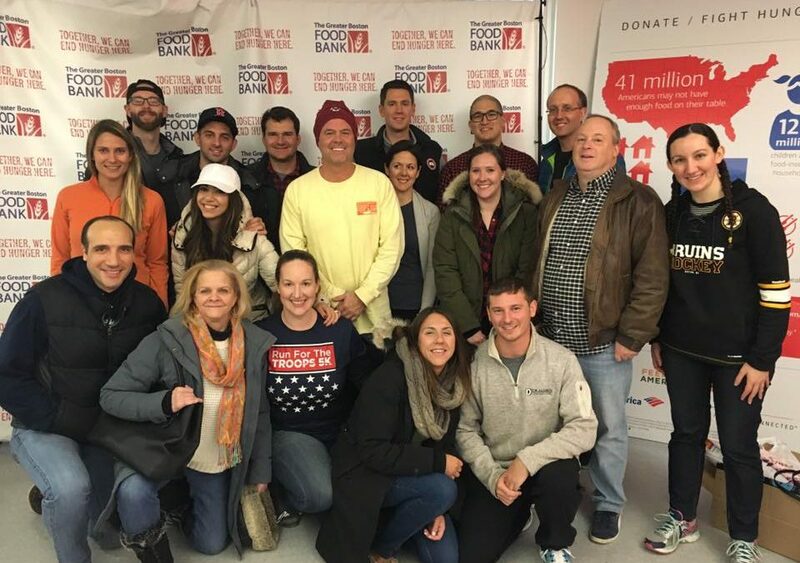 On Veterans’ Day (Saturday, November 11, 2017), in order to honor our veterans and give back to our community, the CMBG3 team spent the afternoon volunteering at the Greater Boston Food Bank. Team members helped to sort, organize, and pack 11,106 pounds of food – enough to provide 8,790 meals to those in need. In addition, the firm donated 90 pounds of canned goods and needed provisions to the food bank, enough to provide almost 70 meals to people in need. A great day serving our community with a great team!! CMBG3 Law looks forward to continuing to support the Greater Boston Food Bank and many other charitable and community organizations. If you would like to discuss our involvement with the community or ways that you can help the Greater Boston Food Bank or any of the ways that CMBG3 Law is involved in the community, please do not hesitate to contact John Gardella (email him or 617-936-4353).